With employees telling customers — and customers telling us — CHS can now report that Everyday Music has found a new home on Capitol Hill. Owner Scott Kuzma said he could not yet talk with CHS about the plans but people familiar with Pike/Pine real estate and customers of the store say the new and used music retailer is slated for a move to the former BMW dealership service garage on 10th Ave — directly across the street from its current home. 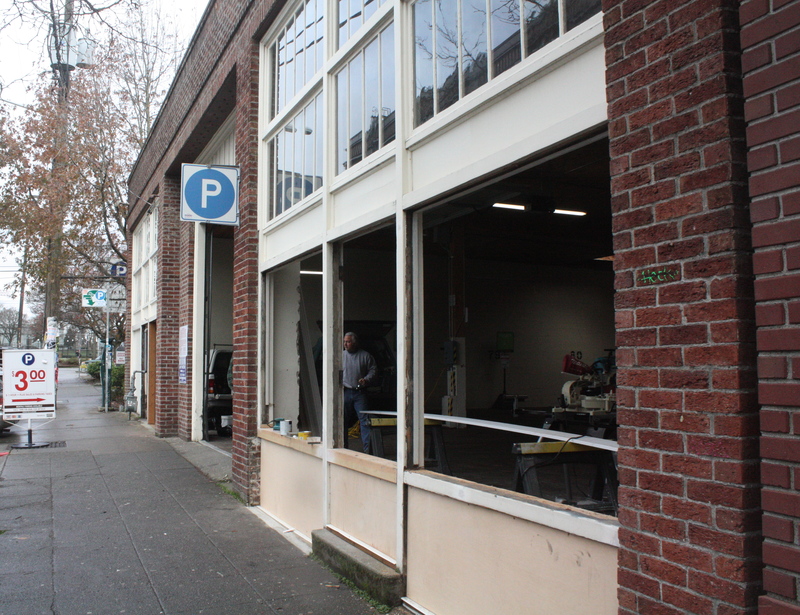 We reported last summer on Everyday getting bumped from its Elliott Bay Book Co.-nestled space. Coming in will be women’s clothing and home retailer Totokaelo. We’ll be talking with Jill Wenger soon about her Capitol Hill plans. Last summer, Kuzma told CHS that an expected boost in business from aligning with Elliott Bay never developed for the music retailer. With a move across the street, it seems likely the proximity hasn’t hurt, either. For anybody who has ever moved within the same apartment building or a few streets up the Hill, you know that moving a music collection one block is no different than moving it cross-country. There is a lot of work to do. When that work will begin in full at the building currently being utilized as a covered parking lot isn’t clear. Everyday’s lease runs through March. From what we can tell, there are no approved construction permits yet for transforming the old auto row building next to Rancho Bravo’s into a retail shop. If the move happens, it will also represent an upgraded use for property controlled by building owner Ron Amundson. Amundson controls many of the open or “transitioning” retail spaces around Pike/Pine including the Rancho Bravo property, the Comet’s building (Correction: the Comet’s building is not owned by Amundson) and the retail space currently inhabited by Ballet and the Square Room. We’ve reported on spaces like Ballet moving to month-to-month agreements with Amundson as the search for higher paying tenants is conducted. Travelers is another example of a Pike/Pine business living in a long, drawn out limbo in an Amundson property — we reported earlier this week that the E Pine Travelers’ boutique component was being closed. The landowner has not replied to past CHS efforts to speak with him about his properties. Prime Capitol Hill location in the Pike/Pine Triangle just one block east of Broadway. Charming historic, brick building with tons of character on this high pedestrian & vehicle traffic block. Neighboring businesses include Oddfellows, Elliott Bay Bookstore, Molly Moon’s Ice Cream, Seattle Running Company, Aveda Institute and Century Ballroom. On 10th Avenue between Pine and Pike. Close proximity to Cal Anderson Park & Bobby Morris Playfield, SCCC, Seattle University and just two blocks from the proposed light rail station. 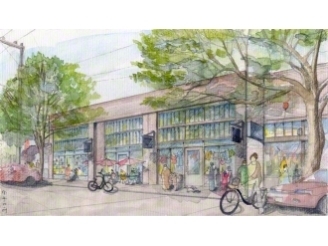 CHS reported on another auto row-era rehabilitation being planned along with new restaurant Mamnoon near Melrose Market. For Everyday, the planned move will be its third since it was displaced from its original Broadway location by light rail demolition and construction. It lived for a time at Broadway and Pine in the space that is now Blick Art Supplies. Despite concerns about a lack of visibility at the location, Everyday moved to 10th Ave in March 2010 to neighbor Elliott Bay. Kuzma said last summer following the move that Everyday’s Capitol Hill location wasn’t keeping pace with the rest of his stores in Bellingham and Portland. Since, another longtime Capitol Hill music retailer has bailed on the neighborhood. Sonic Boom, too, moved after several years on the Hill to be next to an ambitious new shopping project — in this case, the Melrose Market. But by last summer, the record retailer said its Capitol Hill shop was no longer viable and pulled the plug. Meanwhile, Zion’s Gate and Platinum Records are hanging in there on E Pike, Wall of Sound continues on E Pine and Spin Cycle has made a go of it on Broadway by riding the used DVD and CD market. Glad to see they’ve staying on the hill. I can’t believe that the only thing Capitol Hill can support are high-end restaurants and “boutiques.” Places like Everyday, The Comet, and Ballet provide a comfortable place for local residents to shop, eat, and drink at without busting the wallet. Music stores are going to have a rough time even in the most supportive of neighborhoods; more music is now sold digitally, and there’s strong competition even there from the subscription services. Vinyl sells to a small population of hipsters and collectors, but lacks the mass appeal that CDs used to have. I’m a little sad to see them close, because I spent lots of time in these shops in my younger years. But it’s also really nice to be able to log onto a website and get virtually anything instantly and cheaply. My best to Everyday Music; they have a huge challenge ahead. Unfortunately, the direction integral Pike/Pine landowners are going makes it impossible for places like Ballet and The Comet to stay in business and provide a comfortable and affordable place for neighborhood locals. The landowners sit and wait patiently for leases to expire, then jack the rent up 300-400%. The only tenants able to afford that kind of increase need very deep pockets, or a four-fold increase in business.